After a great and successful media tour in Nigeria (4 Cities and 32 media houses) The Survivor Crooner” as she has been called, UNIEKGRACE drops a celebration track "HIGHER HIGHER" featuring Steve Williz and YoungGod of Christ Rydaz, Produced by Yung Williz. 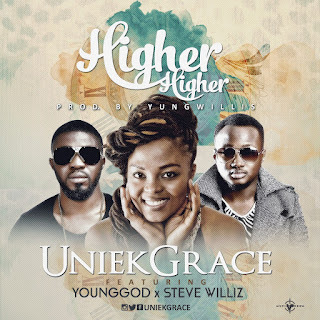 Higher Higher is another one from UniekGrace guaranteed to be on your playlist for a long time. This Belgian based singer-songwriter who is signed under her own record label, AFT media production has her upcoming EP titled E GO BETTER set to drop this December 2017.